I ran the Shelter Bay 10K yesterday. Hot day. 5:30 start. Slow time (54:58) put me right at 50% of the men that ran. At least I ran a reverse split (last half faster than the first). And my daughter Beth likes my garden report. Peas are just awesome now. Basil and currants are coming on. Lettuce continues to be plentiful. 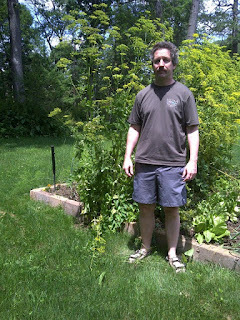 And this is me next to the parsnips which I am allowing to go to seed. Think I will have enough seed? the Recession to Come Out Stronger by Jeffrey K. Liker and Timothy N.
I have driven Toyota's for my last 3 cars. I am on my second Prius now and love it. Toyota makes great cars. factories it had stopped production in). staff and production facilities, but extend to suppliers as well. control car, who in the general public can? into their vehicles that the accelerator could get caught under. the tarnishing of Toyota’s reputation.